Vajrayana has no defect; however, it should be kept secret from the sentient beings who are unworthy vessels of Dharma. 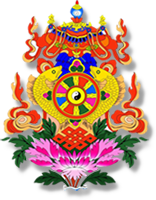 If one practises the vajrayana teachings secretly, he will get the fruit of achievement. For a yogist, both the mundane and the transmundane fulfillment arise from his own Guru. For a yogist who is dependent upon the Guru and has realized the dharma-nature, he need not seek the secular wealth and food – they are naturally fulfilled. The speech career of the Buddhas and Bodhisattvas is no other than Dharma lecturing. Without the Guru staying in the secular world to give lectures, the speech career of the Buddhas and the Bodhisattvas is going to be concealed. Therefore the Guru is the holder of the speech career of the past, present and future Buddhas and Bodhisattvas.